Boston’s J.D. Martinez celebrates in the dugout after scoring on a single in the second inning Sunday against the Chicago White Sox in Boston. 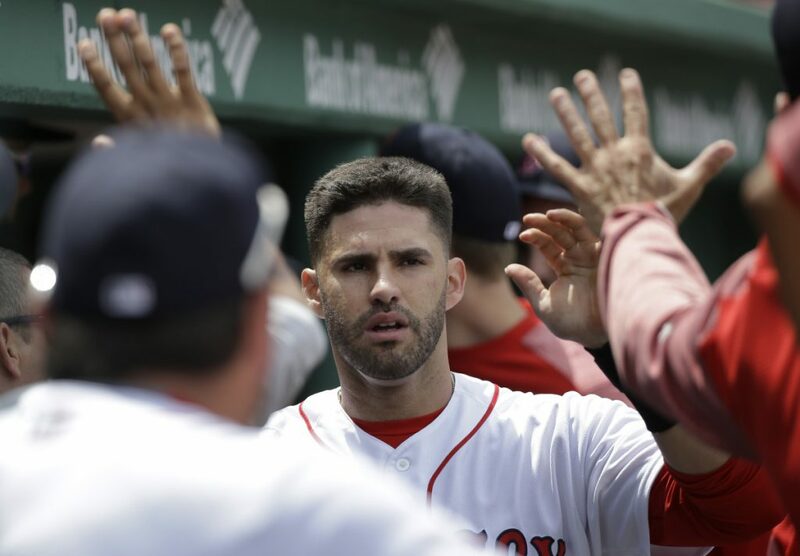 BOSTON (AP) — The Chicago White Sox had a tough time scoring runs during their weekend in Boston. However, the pitching staff came through to deliver a big series victory over the Red Sox. Reynaldo Lopez pitched into the seventh inning, Daniel Palka had a two-run double and the White Sox beat the Red Sox 5-2 Sunday to win two of three games against one of the majors’ best teams. Chicago took the set by a 8-6 margin, eking out a 1-0 win Friday against Red Sox ace Chris Sale before losing 4-2 on Saturday. White Sox pitchers held Boston to a combined .186 average (18 for 97) in the series. Chicago’s Charlie Tilson, left, is out at second as Boston’s Brock Holt, right, throws to first in the second inning Sunday in Boston. Lopez (2-4) gave up two runs and six hits while striking out six with three walks in 6 1/3 innings to improve to 1-3 in eight road starts this season. Joakim Soria pitched a scoreless ninth for his eighth save. Abreu ripped an RBI double to left field on the 11th pitch of the game, scoring Yoan Moncada from first to put Chicago ahead 1-0. Devers tied it with his RBI single to center in the second after J.D. Martinez’s leadoff double. Porcello hit Matt Davidson on the hand with a fastball to load the bases with one down in the third. Omar Narvaez popped out to shortstop the next at-bat, but Porcello walked Tim Anderson to force in a run and put Chicago ahead 2-1. Red Sox: OF Mookie Betts (10-day disabled list, left abdominal strain) continues to progress towards a rehab assignment. Cora said Betts hit in the cage during Sunday’s game and had “a great day.” … 2B Dustin Pedroia (10-day DL, left knee inflammation) still has discomfort, but will travel on the team’s upcoming road trip. “It’s been a slow process,” Cora said. Palka saw plenty of familiar faces in the stands this weekend. Both his brother, who lives in nearby Nantucket, and mother attended the series at Fenway Park. “I like coming here, here and Pawtucket (R.I.), because I get to see a lot of people I know,” he said. Porcello didn’t give up a hit in the third or sixth, but the White Sox scored a run in each inning thanks to his three walks and one hit batsman. “It was a battle,” Porcello said. “I really felt like I pitched the ball a lot better than I did, mainly the walks.